So here’s a good question. 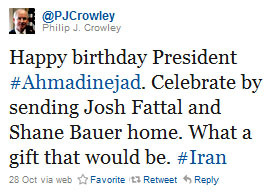 Thursday was Iranian President Mahmoud Ahmadinejad’s birthday, so Assistant Secretary of State for Public Affairs Philip Crowley tweeted the message on the right. Shane Bauer, of course, has written for Mother Jones in the past, so we have a personal interest in this case and were happy to see Crowley keeping it front and center. The reason I think that it is noteworthy is that I suspect that the notion that the Obama administration is “kowtow[ing]” and “coddl[ing]” Iran via sincere birthday greetings will probably become a meme on Fox News and on talk radio — the further dissemination of false information. This is unfortunate. It is one thing to have a different perspective on how to deal with a problem, quite another to make things up. So waddaya think? Is the conservative noise machine going to pick up on this meme? I think it’s a stretch even for them, but I don’t plan to turn on the TV or the radio to find out. And they’ve certainly surprised me in the past. So if they do, let us know in comments.